To be successful with investing and to get the best rate of return your risk profile can accept, all investors need to apply a systematic approach to selecting an investment. The rate of return of your portfolio is very important to generate wealth as discussed in the Wealth Triangle Guide. One particular pillar of the Wealth Triangle is your stock selection process. Over the past 8 years, I have been working on refining the stock selection process I use and I believe to have refined the process that highlights the top stocks at a point in time when you have money to invest. Stock Selection Made Easy is how I describe it. The dividend yield, the payout ratio and the dividend growth can tell you a lot about a company’s trend and ability to pay their dividend. Consequently, if the company can keep on increasing its dividend without impacting the other metrics, it implies it is making profits through increased revenue. If the dividend grows annually, we can assume there is an increase in profit to give back to shareholders. To confirm, review revenue and EPS growth. If the dividend yield is within a certain historical range and has not dropped or increased, we can assume the stock price is growing along with the dividend growth. The short term fluctuations are just a factor of price movement. If the dividend payout ratio is in line with the targets, we can assume that earnings have increased supporting the first assumption. If the company is dominant, we can expect less speculation on the numbers by investors. If the company passes the assumptions above, there is growth expectation in both stock price and dividend and you can, therefore, expect growth in line with the Chowder Score. Take a company with an annual dividend growth but no earnings growth, the dividend payout ratio would increase and signal a problem. Next, we all know a rising dividend yield signals challenges ahead and potentially followed by a dividend drop. 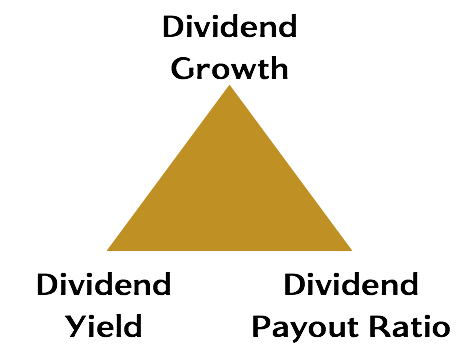 The last pillar of the dividend triangle is a little harder as you need to track years of dividend history and calculate growth. What you want is consistency between the 3-year, 5-year and 10-year growth with a value around 10% if possible. Do note that both dividend growth and dividend payout ratio are adjusted quarterly or annually while the stock price moves every day adjusting the dividend yield in the process. When looking at the yield against historical data, you can assess if it’s running ahead or pulling back. While the dividend yield is a pillar of the dividend triangle, the yield itself is not what matters but the comparison to historical and sector norms. The Dividend Snapshot Opportunity Score was formulated to surface companies that can meet a potential rate of return identified based on a rigorous set of criteria (supporting the dividend triangle). Back in 2009, the Canadian Dividend list was created for personal use and it evolved year after year with refinements to the formula. In 2015, the list was released on Dividend Snapshot to offer other investors the opportunity to use the data to make investment decisions. In 2017, at the request of many investors, a Canadian REIT list was also released taking into account the FFO and AFFO data points unique to the best Canadian REITs (Real Estate Income Trusts). I am a believer that a well-diversified dividend growth portfolio can support generating the necessary income in retirement provided the Wealth Triangle is at work compounding your portfolio. So far, my strategy and investment philosophy has provided me with an annual rate of return above 10% since 2009. There are 2 dimensions at a minimum to look at when researching a company and they both work together based on the risks you want to take. The business quality assessment is a qualitative approach based on the ability for the company to have a competitive advantage. Often times, the company could have a competitive advantage locally while establishing a footprint in international markets. In some cases, it’s dominant across many countries or the entry cost is prohibitive or very regulated. A company with a large market share, or above average, in their industry will lead to a competitive advantage. When a company has a competitive advantage, it can focus on growing and cost management rather than the ever-present competition. A dominant company will have a larger market share than its competitors for the industry it operates in. A company like Canadian National Railway TSE:CNRNYSE:CNI Railway doesn’t have much competition in the railway business but the shipping and transportation have some competition. As a business, it still tries to dominate for certain type of goods. A company with international business such as Magna International Inc TSE:MGNYSE:MGA has broken a local market barrier and has more potential for growth. With more demand, the cost of production can often go down. There are also other benefits from international expansion, the companies can operate in a different location with favorable tax rates or costs benefiting the shareholders. The company’s size also plays a role in identifying the business quality. A conglomerate will have grown by having a solid business offering of goods or services. If there wasn’t a market for the goods or services, it could not have grown. The size is proportional to the market it can operate in based on the economies of the country. With the Dividend Snapshot lists, a final percentage is assigned to each stock listed based on current and historical data. What I found that was important for deciding on an investment during the incubation period of the list was to see movements between the stocks listed. If the formula is too strict, the same stocks surface up but if there are enough variables, it can allow for movement and with the appropriate thresholds, there is enough movement with earnings update or stock price fluctuation. As such, when generating a score, it was necessary to not just assign a yes or no rating for meeting the criteria but to provide a scale for each criteria as not all strength are equal. When using a quantitative approach with a scale, it’s important to understand that both end of the scale can be a risky investment. While the bottom of the scale is clear, the top of the scale is not always clear. Think of SNC Lavalin TSE:SNC for example, when it had trouble with bribes, the stock’s opportunity score shot up due to all uncertainty around the legal implications and future contracts. While we may not put a valuation on the stock price itself to assess if a company is worth holding, the stock price can be used to assess an opportunity for purchase. The P/E is an assessment by investors on what they are willing to pay for current earnings. The higher the P/E the more speculative future earnings become. The score for P/E is based on how is the stock’s P/E compared to the sector average? An assessment against the peers is the best since they are valued in a similar manner. Let me first say that high yields are not sustainable for stocks. The dividend yield is expected to be within a certain range with an optimal rate between 3%-5% depending on the sector average. Based on the sector average, the payout ratio is evaluated to identify if it follows the sector patterns, if it’s better or if it’s out of line. Ten years of data is used to assess the dividend growth and ensure it meets the growth expectation. More data is provided outside the score for investors to choose their own growth. The Chowder Score is also provided as an added data point but not used in the formula. The first two variables are looking at current data metrics changing daily, and by quarter, while the last three data points represent the dividend triangle with historical and sector comparisons in place. For example, a 1.5% dividend yield may be low for a stock but when compared with the sector, it may very well be in line. The same can be said for a 60% dividend payout ratio. Sector and industries have certain established parameters based on their business so you cannot pick specific thresholds for all stocks as not all businesses are equal in their ability to pay shareholders back. You can build your own score as well by including other metrics such as debt ratios or even use the Graham formula to identify undervalued stocks. A third area of research investors can evaluate is what management does with the company. They are in charge of spending, research, paying debts, rewarding investors, or buying back shares. In short, they control the money the company earns. The big question is if you trust management or not. Research in this area is not simple and requires investors to listen to earning calls and what management has to say. Share buy-backs are usually announced but paying debt or the reasons why they take loans are either found deep in financial reports or mentioned in earning calls. Without the manpower to listen to all calls, DIY investors are left with data to interpret what management is capable of. This is where 10-year of historical data can be used in some ways to assess a trend in management decisions along with the dominance of the business quality. Once all the data points are understood, the opportunity score can easily be used. It’s only normal that you can relax the threshold with more ‘dominant’ companies as competition is limited and they already own a large portion of the market. There is less risk in the end. With a ‘normal’ business, there is potential for disruption so it’s important to be a little more stringent.